1 x MSR 775ml Stowaway Pot a useful sized pot in which products nest. 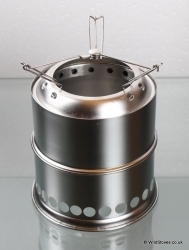 1 x Aluminium Windshield for sheltering your stove from the elements. 2 x Drawstring bags: a small one for the stove; a larger one for the entire kit.